Homepage. 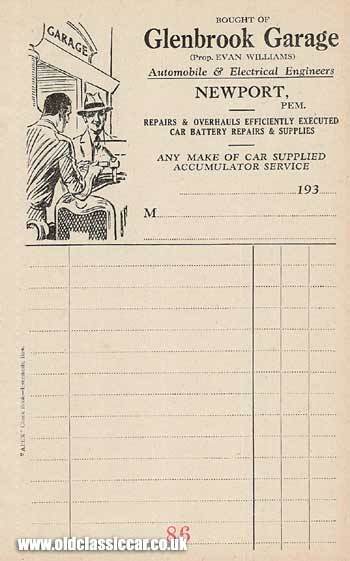 This page: Paperwork from this motor engineers located in South Wales during the thirties. This particular billhead dates to the 1930s and was one that would have been used by Glenbrook Garage. This particular motor engineer was based in Newport, Pembrokeshire, which is down in the South West of Wales. The proprietor, a Mr Evan Williams, could offer "Repairs and Overhauls efficiently executed" and "Car battery repairs and supplies". This piece of paperwork also suggests that they could supply any make of car, so it sounds like they sold new or used cars, as well as maintaining cars that belonged to the locals. The illustration shows a mechanic working on a smart touring car, although with the bonnet closed, perhaps that is a fuel nozzle being inserted into a scuttle mounted fuel tank? The hatted owner looks on approvingly. This particular receipt would have come in a book of receipts, but why this one never got used I don't know. Does anyone remember Glenbrook Garage, or have photos of it? I'd be very interested to see them if possible.